Augmented Reality has been around for a while now and was first used in the car industry. However, it’s only really recently that augmented reality apps have begun to pop-up all over various app stores, so we thought we’d give you some idea of what they can be used for. Basically, rather than virtual reality, when you ‘enter’ a virtual world, augmented reality is intended to enhance what you see in front of you via an app that uses your mobile camera to overlay a product/restaurant or anything else with more information on it. So for example, if you use an app that allows you to point at a restaurant or some other outlet, then the app will produce more information such as menus, reviews, prices and more. You can get AR apps that help you to find your car when you’ve parked in a strange town by simply pointing your device at your car when you leave and then being directed by via maps on your way back. Far from it, there are a plethora of apps available that can help you do anything from find a house to deliver a completely individual shopping experience. In the US recently, IBM unveiled an app that will allow shoppers to download the store’s app in-store, put in a few personal details and as you shop, holding your mobile up to any products from gadgets to foodstuffs, will allow you to access a wealth of information about a product. So, say if you have just discovered that you have a wheat intolerance for example. Sometimes, it can be very difficult to establish if a product contains wheat unless you intend to stand there half the day reading small print on labels. 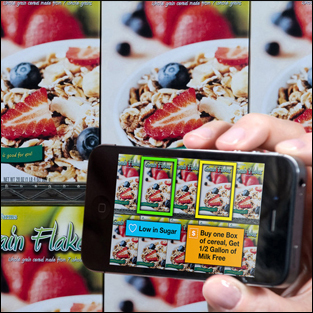 With an augmented reality app, this can all be done for you simply by holding your phone’s camera up to the product. Further to this, you can set up personal shopping lists, add your products to the cashier at the checkout whilst you continue shopping and plan meals with recipes all at the touch of a button. The pay-and-go feature of some of these apps are invaluable if you hate waiting around in queues, as the cashier already has all the info on everything you’ve bought which has been sent to him/her via the shop’s back-end database. Another aspect to AU which is also beginning to take off is used by estate agents. See a house for sale that you like the look of? Just download the app, hold your mobile up to the For Sale sign and access the layout of the house, prices, how much repayments will be on the mortgage, arrange viewing and meeting with mortgage brokers, all from within the app. With this kind of app, you can also access information on the price of other houses in the area, as well as the location of schools and crime rates and so on. Augmented reality apps are growing rapidly in popularity across all kinds of industries and are perfect for the consumer, to make life easier, and businesses, who can harness the technology to provide a wealth of information about their product or service. AR apps are the next step up from QR codes, which give basic information and allow you to access mobile websites by scanning them. AR apps are expected to generate 1.4bn downloads by 2015, and the market for AR is forecasted to be worth as much as $350m by 2014 in the US alone. So if you’re thinking of developing an app for your business, perhaps it’s wise to practice forward-thinking and get your company an AR app – they are so flexible and can be used for such a variety of products and/or services, that it’s certainly worth thinking about as part of your marketing plan.